Did you ever stumble across a comic from one of your favorite creators that you didn’t know about and then gasp, “Gee I almost missed that!”? In today’s Previews-driven world, some fans complain the surprise of comics collecting and reading is gone. It’s so easy for a well-informed fan to know exactly what’s coming out when, what it’s about, and what creators are working on it. But with the deluge of information flooding us, every once in a while we get a nice surprise. 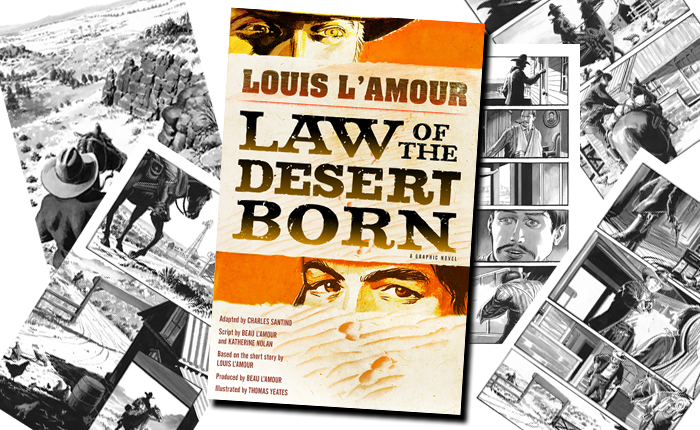 Louis L’Amour’s “Law of the Desert Born” is one of those surprises. Despite having enjoyed the free comic last year during Free Comic Book Desk (does anyone else remember that? ), this graphic novel was off my radar. But it crept back “on screen” and I’m so glad it did. This is not a run-of-the-mill comic or graphic novel. A gorgeous oversize hardcover volume with a sepia dust jacket, Charles Santino adapts a short story by Western author Louis L’Amour, based on a script by Beau L’Amour and Katherine Nolan. 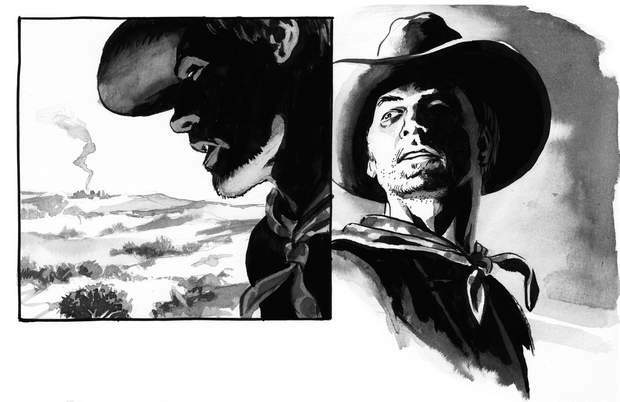 The art is wonderfully rendered in black and white, with lush inks and washes by Thomas Yeates. You know Yeates’ work from Swamp Thing, Airboy, Tarzan, Zorro or perhaps just as the current artist on Prince Valiant. Thanks to the Encore channel, I’ve been enjoying quite a few Westerns lately (much to my patient wife’s chagrin). But this is far from a typical western. The story starts in the middle of the action (you almost think Chuck Dixon wrote it!) and then brings the reader back around the track to fully flesh out the tale. And unlike the “typical Western,” there are few clear good guys and bad guys. Every character has a little good and a little bad in of each in them. And to further distance it from a typical Western, there are parallels to the struggles and desperate times of today’s middle class. “Law of the Desert Born” offers a wide variety of characters. One of the lead characters has a unique ethnic background that you find all too rarely in pop fiction. The female lead has a handicap. And in this story, they are all mature characters grappling with mature problems. If you are the type of person who only enjoys dramas on the CW, this one isn’t for you. The art is so solid and dependable that you don’t realize what a phenomenal gift Yeates is giving you. Oh, sure, he provides all the basics: solid figures, strong storytelling, a sense of balance to each page. But Yeates is very good at “casting” interesting characters for each part and then wardrobing them in authentic-but-not-hackneyed period outfits. I’m not a horse lover, but even to me his horses look beautiful and majestic. The third act of the story takes place in a particularly harsh desert environment, and Yeates’ detailed imagery brings it life and helps you feel the sun beating on your face. One other observation: Just as you’d expect from a graduate of the Joe Kubert School, you can see a few whispers of Joe in the finished pages. 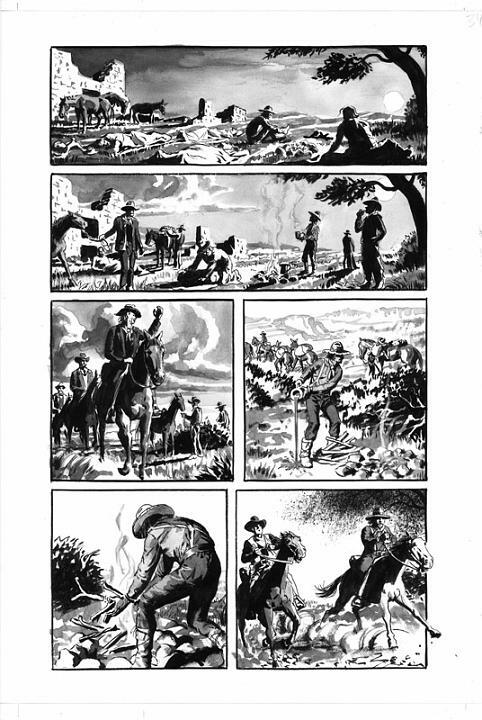 Yeates serves up a great variety of both traditional and non-traditional page layouts. And then every once in a while, a page with a sweeping landscape with creatively inset panels bursts forth. And then you realize the student has learned from a master, and is now a master himself. So, I reckon this is th’ one whut almost slipped by me, partner. 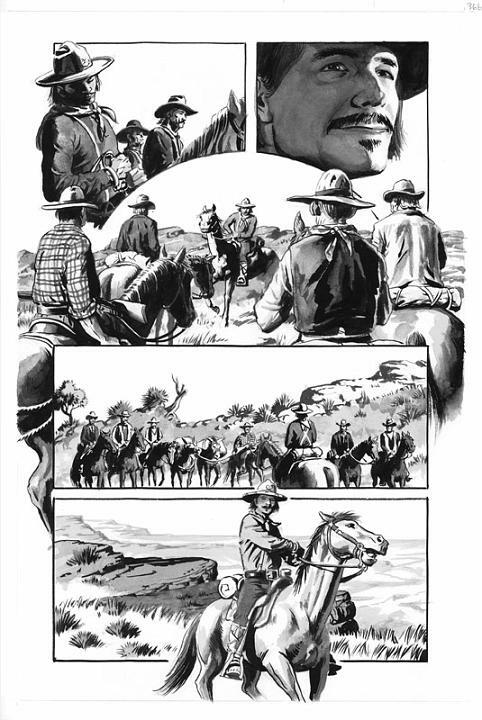 A Western, oversized graphic novel from a publisher that’s not really known for comics. Can you really blame me? But I’m really glad it didn’t and I’d encourage you to seek it out. “Law of the Desert Born” is published by Bantam Books is is cover-priced at $25.